Many perfectly sane people would question the apparent futility of planning to rebuild a city when bombs are still falling. Yet, that’s exactly what The Aleppo Project is setting out to do. As barrel bombs and shells continue to fall on Aleppo, a small group of people believe that the time to discuss reconstruction is now – and that the earlier thinking about the process starts, the more successful it can be. Their goal is to gather information about the past of the city, effectively document its destruction and begin to plot the historic city’s reconstruction. Since Syrians rose up against President Bashar al-Assad in 2011, the nation has endured full-on armed conflict lasting more than five years. UN estimates suggest at least 400,000 casualties. Syria’s historical heritage has also been under fire, its six UNESCO classified sites having been severely damaged or destroyed. This includes Aleppo’s historic Old City – one of the world’s oldest continuously inhabited cities, bombarded by rockets, shells and other artillery, much of which lies in ruins after more than five years of brutal civil war. The Aleppo Project is an open collaboration. It connects Syrian refugees and students in Lebanon and Turkey and invites people from around the world to help determine how to reconstruct Aleppo’s urban life once fighting ceases. Based in Budapest at the Centre for Conflict, Negotiation and Recovery at the Central European University’s School of Public Policy, it’s made up of students, professors and others from various departments. Driving The Aleppo Project is a four-person research team, led by Professor Robert Templer. The team conducts public opinion surveys, maps destruction, looks at historical case studies for rebuilding war-torn cities and lays the groundwork for an inclusive reconstruction process. The Project also invites Aleppo’s citizens – whether still in the city or displaced from it – to contribute by providing information about destruction in the city, and by blogging and recording their memories of and hopes for the city. 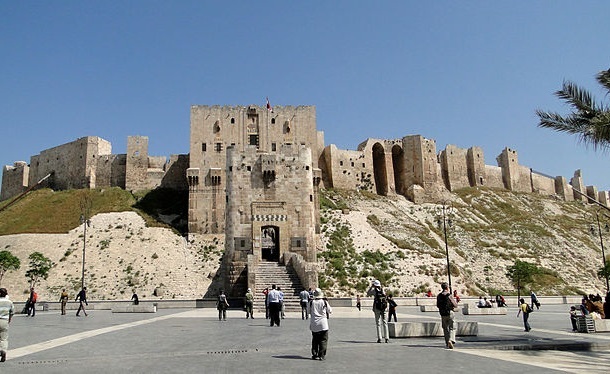 Image courtesy of Bernard Gagnon, shows the Aleppo Citadel in 2010, before fighting began.